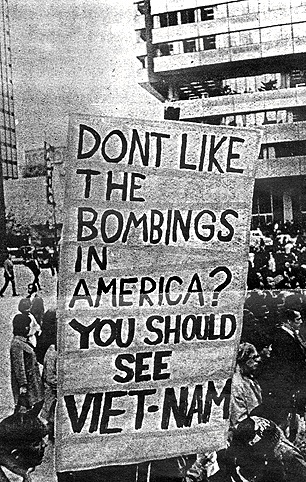 1971 Bombings sign at a demonstration. "It was the first riot I ever saw," said a legal secretary eating her lunch in Zellerbach Plaza Monday while workers replaced the glass walls of the cute round Wells Fargo Bank branch on the southwest corner. The glass had been broken during the May Day demonstration last Wednesday. Despite the heavy concentration of police and the glib remarks of Mayor Alioto, there was no business as usual on May 5. The demonstrators were unable to physically stop the war machine. But psychologically they laid a heavy number on the head of the financial district. Royal Dutch Shell Oil executives were so paranoid that all the names were removed from office doors two days before May Day and the directories on each of the 28 floors of corporate bureaucracy were covered. And on May 5 the doors of each office were kept locked. All armored car deliveries of cash and securities were canceled. This fact was kept secret, however. For many of the workers in the financial district, it was the first time they had seen the police in action. "I never saw them swinging their sticks before," said a public relations writer for Standard Oil. "It was awful." Just about everyone in the Monday noon crowd at Zellerbach Plaza had some kind of police atrocity story to tell. "They just started beating this fellow for no reason at all," recalled a stock clerk for Dean Witter. He pulled out a copy of a letter he had written to Chief Nelder protesting the brutality. A handful out of the tens of thousands who serve the corporate giants didn't just stand in their windows digging the violence in the streets below. One elderly architect physically tried to stop the pigs from beating up a demonstrator. For his trouble, he too got arrested. One properly dressed man handed his business card to one longhaired freak as he was being pushed into the paddy wagon with instructions to call him after he was booked. The properly dressed man was a lawyer. Later, he said he didn't have any sympathy with the demonstration but thought the police were out of hand. The cops had their fans, too. One middle-aged matron, a bookkeeper, proudly recounted how she had thrown water on a group of protesters as they passed under her window.